A value specifying whether to measure a rising or falling transition. Rising 0 The node measures a rising transition. Falling 1 The node measures a falling transition. The transition to measure. An edge number of n with rising polarity selected indicates that the node measures the nth rising transition it detects in the input waveform. High and low reference levels required to determine the transition interval. A rising high ref level crossing defines the end of a rising transition and a falling high ref level crossing defines the beginning of a falling transition. mid ref level is not used in transition measurements. A rising low ref level crossing defines the beginning of a rising transition and a falling low ref level crossing defines the end of a falling transition. 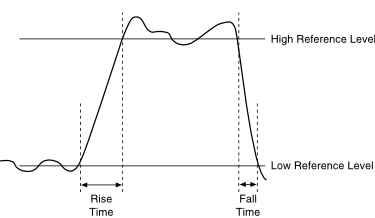 The rate of change of the signal in a transition region between high reference level and low reference level. Time span, in seconds, of the transition. Height of the local minimum preceding a rising or falling transition, which depends on the polarity you specify. Undershoot measures the height as a percentage of the histogram-based amplitude of the signal. Height of the local maximum preceding a rising or falling transition, which depends on the polarity you specify. Overshoot measures the height as a percentage of the histogram-based amplitude of the signal. Height of the local minimum following a rising or falling transition, which depends on the polarity you specify. Undershoot measures the height as a percentage of the histogram-based amplitude of the signal. Height of the local maximum following a rising or falling transition, which depends on the polarity you specify. Overshoot measures the height as a percentage of the histogram-based amplitude of the signal. Transition interval end points and the absolute reference levels used to define the transition. Time of the rising low reference level crossing or falling high reference level crossing that defines the start of the transition to be measured. Time of the rising high reference level crossing or falling low reference level crossing that defines the end of the transition to be measured. The following illustration shows the undershoot and overshoot when polarity is Rising. The following illustration shows the undershoot and overshoot when polarity is Falling. This node calculates pre-transition: undershoot and pre-transition: overshoot according to the following table. To calculate pre-transition: undershoot and pre-transition: overshoot, this node searches for a local minimum and local maximum in the pre-transition aberration region immediately preceding the beginning of the transition specified by edge number and polarity. 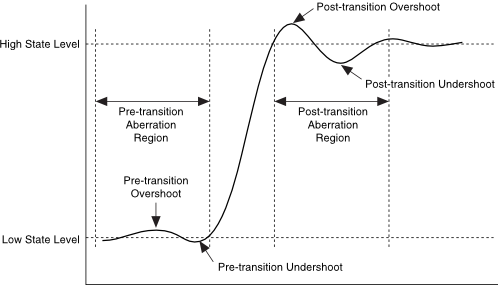 The pre-transition aberration region is defined as the minimum of 3*(end time - start time) and (current transition start time - previous transition end time)/2. If the transition to measure is the first in the waveform, the interval is defined as the minimum of 3*(end time - start time) and (start time - beginning of the waveform). This node calculates the high state level, low state level, and amplitude from the input signal. 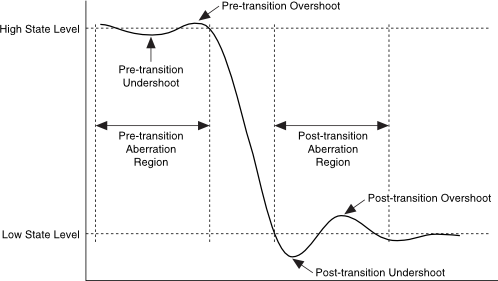 This node calculates post-transition: undershoot and post-transition: overshoot according to the following table. To calculate post-transition: undershoot and post-transition: overshoot, this node searches for a local minimum and local maximum in the post-transition aberration region immediately following the end of the transition specified by edge number and polarity. The post-transition aberration region is defined as the minimum of 3*(end time - start time) and (next transition start time - current transition end time)/2. If the transition to measure is the last in the waveform, the interval is defined as the minimum of 3*(end time - start time) and (end of the waveform - end time). This node calculates the high state level, low state level, and amplitude from the input signal.